Cosmin TRG, Azari & III, Material World, Benjamin Damage, Boddika and more. Due to some personal reason, I don&apos;t think I&apos;ll be able to upload a regular monthly podcast again. So I&apos;m gonna starting a new "sometime based" podcast collection. 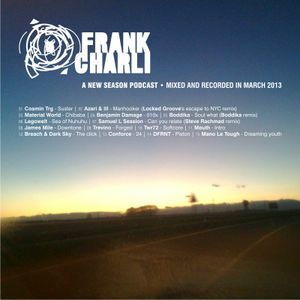 This is the first of A NEW SEASON mix series, and it&apos;s been recorded in March, 1st 2013. Features some of my best producers of the moment, covering different genres between house and techno, spacing from bass music to vintage synth music through experimental off beats tunes and straight groovy techno. Check it out new tracks from artists such as Cosmin TRG, Azari & III, Material World (members of Mouth and Second Chance), Benjamin Damage, Boddika, Legowelt, Samuel L Session/Steve Rachmad, Trevino, Breach & Dark Sky, DFRNT, Mano Le Tough and more... and enjoy the groovy style in mixing technique. Unfortunately is still mixed with Traktor Dj and an external mixer, but I tried to mantain a basic "on hands" control of a two decks setup.